Dr. Sujata Kelkar Shetty is a US trained biological scientist with publications in peer-reviewed journals. She did her post- doctoral training from the National Institute of Child Health and Human Development, National Institute of Health, Bethesda, MD. While at the National Institute of health she was curious about the interaction between the mind and the body and studied the mechanisms of how mental stress negatively impacts our physical health. Dr. Shetty has been focused on researching and writing on preventive health for the last decade. 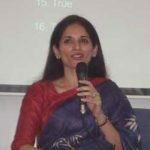 Sujata writes a regular preventive health column for Mint – the leading Business Newspaper of India.Her writing is unique in its emphasis on cutting edge medical research and age old Ayurvedic practices. She also gives Wellbeing seminars and workshops to organisations. Like her writing, the wellbeing seminars and workshops are unique in their emphasis on research studies that unequivocally show how and why certain lifestyle habits enhance wellbeing and prevent both mental and physical disease. Dr. Shetty is an ICF Certified Life coach. She assists people in regaining their health and finding their bliss by combining her training Coaching with her expertise in wellness. Life Coaching is an experience of personal and professional development unlike any other. The client is held naturally creative, resourceful and whole, and capable of finding their own answers regardless of the challenge. Dr. Shetty is a trained classical musician and enjoys singing Ghazals and Sufi compositions. She has a Bachelor’s degree in Genetics from University of Wisconsin- Madison and a PhD in Toxicology from the University of Kentucky-Lexington.